Adult specimen with typical body patterning. 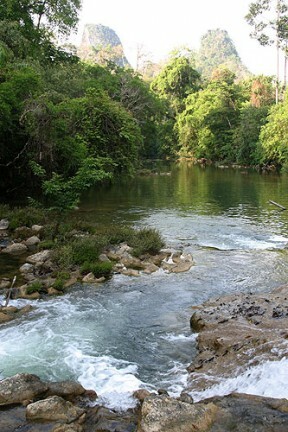 ...which in Thailand flows through a forested nature reserve. S. beauforti is classified as 'Near Threatened' by the IUCN. 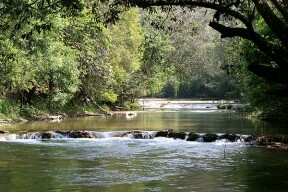 Described from ‘Tadi stream’ in Nakhon Si Thammarat province, southern (peninsular) Thailand but subsequently recorded from neighbouring Trang province and much further north in the Ataran River (part of the upper Salween basin and known as ‘Kasat’ river in Thailand), western Thailand/southern Myanmar and the Chao Phraya system, central and western Thailand. It probably also occurs in the Mae Klong drainage in western Thailand but previous records from the Mekong River apparently refer to two species formerly considered synonyms which Grant (2007) tentatively recognised as valid; S. yunnanensis (Chen, 1980) from the upper Mekong and S. formosanus (Pellegrin & Fang, 1940) from the lower Mekong. Wild populations appear to have declined by at least 20-29% since 1997 according to a 2007 IUCN survey in which damming of rivers, pollution and collection for the aquarium trade were all cited as contributing factors. 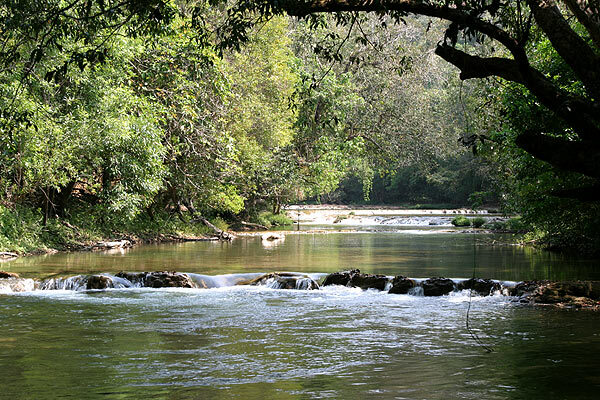 Images of the Ataran River habitats depict flowing sections of forest-shaded, seemingly well-oxygenated headwaters with clear water, a mixed sand/rock substrate and lots of submerged driftwood/leaf litter. In the Hanthayaw (Suriya in Thai) River, upper Ataran basin aquatic plants include Pogostemon helferi and a species of Cryptocoryne while sympatric fish species comprise Acanthocobitis rubidipinnis, Botia kubotai, Syncrossus berdmorei, Pangio fusca, Crossocheilus burmanicus, Parambassis pulcinella, Puntius orphoides, Pethia stoliczkana, Microdevario kubotai, Hampala salweenensis, Poropuntius scapanognathus, Glyptothorax dorsalis, Batasio dayi, B. tigrinus, Akysis vespa, Amblyceps caecutiens, and Tetraodon cutcutia. 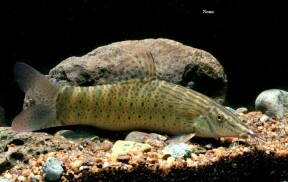 In the Ataran other fishes recorded were Schistura vinciguerrae, S. robertsi, Garra sp. ‘redtail’, Mastacembelus armatus plus unidentified members of Devario, Scaphiodonichthys, Tor, Neolissochilus, Garra, and Schistura. 160 – 180 mm. Records suggesting this species can attain 250 mm are erroneous and apparently refer to S. berdmorei. Minimum base dimensions of 150 ∗ 45 cm or equivalent are required for long-term care. pH: Seems to prefer slightly acidic to neutral water in the range 6.0 – 7.5. This species is very similar in appearance to S. berdmorei which is native to India and Myanmar, and has been widely mislabelled under that name in older aquarium literature. The two can appear identical on first glance but there are some notable differences, most obviously possession of 9-10 branched dorsal-fin rays in S. beauforti vs. 11-14 in S. bermorei, and the fact that even young specimens of S. beauforti exhibit laterally-orientated rows of small, dark markings running across the entire body and head whereas in S. berdmorei these markings are relatively larger and in young individuals appear first in the region behind the opercle, extending further along the body as they mature. In adult specimens of both species the vertical body bars sometimes fade leaving only the rows of dark markings, particularly in S. beauforti.